Turin, 2 July 2018. The Nexa Center for Internet & Society at Politecnico di Torino (DAUIN) today announces the Nexa community for the 2018-2019 academic year. This year a new Fellow, Lara Merla, Ph.D. candidate in Law and Institutions at the University of Turin, as well as a new Faculty Associate, Simone Arcagni, Associate professor at University of Palermo (Cinema and Media), will join the Nexa community. They all have already collaborated with the Nexa Center on several topics including computer vision, big data, privacy and protection of user data. Lara Merla is currently a Ph.D. candidate in Law and Institutions at the University of Turin. She earned her Degree in Law from the University of Turin in 2015 and her LLM in Comparative Law, Economics and Finance from the International University College in 2017. Her publication record includes the article “Droni, privacy e tutela dei dati personali” published by "Informatica e Diritto", Redazione Ittig in 2016. She is also a peer reviewer for the international review "Global Jurist". Since 2014 she regularly attended seminars and lectures at the Nexa Center for Internet & Society. 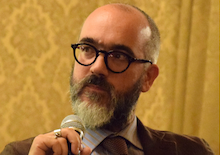 Simone Arcagni is Associate professor at University of Palermo. His main research interests encompass cinema, new media and new technologies. Moreover, he teaches at Scuola Holden in Turin and IULM University in Milan. He is curator of “Digita!”, head of EmergingSeries research group and director of “EmergingSeries Journal”. He regularly collaborates with: “Nòva-Il Sole 24Ore”, “Film TV”, Oxygen”, “Segnocinema”, “Agorà” and other scientific reviews. He runs a personal blog (Postcinema) on “Nòva100” site. He is consultant and collaborator of different festivals, conferences, editorial series, reviews, and he further take part to many national and international scientific boards. Visioni digitali. Video, web e nuove tecnologie (Einaudi 2016) is his last work. Honoring the ethos of "networking" which is central to an Internet & Society center such as Nexa, the Nexa community is also complemented by other three Faculty Associates , who will actively collaborate with the Nexa Center community through an array of channels. These relationships, as well as the countless engagements with alumni, partners, students, interns, and other colleagues, are fundamental to the Nexa Center’s work and identity, and serve to increase the capacity of the field. The Nexa Center remains proud of and grateful to the following returning community members who will retain affiliations at the Nexa Center in the coming year. Antonio Casilli, Alessandro Cogo, Enrico Donaggio, Massimo Durante, Marco Torchiano. Davide Allavena, Mauro Alovisio, Claudio Artusio, Eleonora Bassi, Simone Basso, Lorenzo Benussi, Enrico Bertacchini, Carlo Blengino, Nicola Bottero, Lorenzo Canova, Fabio Chiusi, Marco Ciurcina, Deborah De Angelis, Giulio De Petra, Arturo Filastò, Giovanni B. Gallus, Raimondo Iemma, Antonio Langiu, Stefano Leucci, Alessio Melandri, Federico Morando, Fabio Nascimbeni, Guido Noto La Diega, Monica A. Senor, Massimo Travostino, Giuseppe Vaciago. Giancarlo Frosio, Daniele Trinchero, Giorgio Ventre. The Nexa Community is also formed by the Nexa Board of Trustees .